When I first made this "pâté," it was from a recipe in Food & Wine. I've since seen it reprinted in Paula Wolfert's book The Cooking of the Eastern Mediterranean and adapted it as my own. This makes a terrific party appetizer not only because it tastes better when made in advance, but also because everyone — vegetarians and omnivores alike — eats it up. In a large saucepan fitted with a steamer, add enough water to fill the bottom of the pan. Steam the spinach until almost tender, then add the garlic cloves and cook a couple of minutes longer. Drain the spinach and, when cool, squeeze out as much water as possible, reserving ⅓ cup of the spinach liquid. Coarsely chop the spinach and place in a medium bowl. Peel the garlic and set aside. In a mortar or food processor, pound or pulse the walnuts with ½ tsp. salt, coriander, cayenne, and the peeled garlic, until the mixture is pasty and oily. Blend in the reserved spinach water. Add the walnut mixture, cilantro, parsley, and onion to the spinach, and mix together with your hands. Add the vinegar, remaining salt, and black pepper; season to taste with vinegar, salt, and pepper or cayenne. Divide mixture between two lightly oiled bowls or large ramekins, cover tightly with plastic wrap, and refrigerate several hours or overnight. To serve, bring the spinach pâté to room temperature and invert onto serving plates. 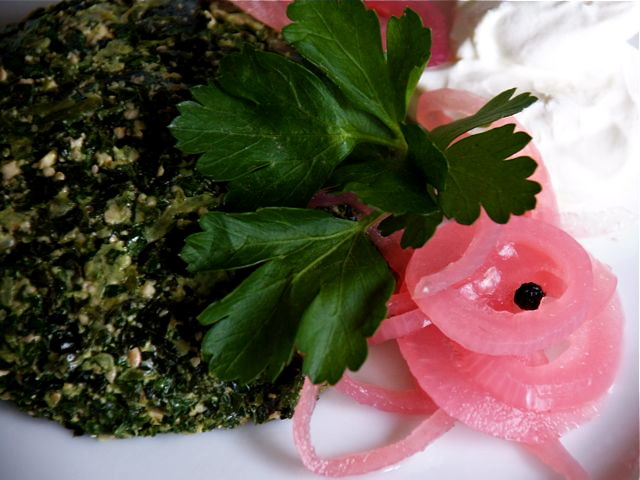 Garnish with thin slices of red onion and a dollop or drizzle of sour cream, and serve with crisp rye crackers on the side.